During a six-year period (2010–2015), the eight colleges of the Ivy League — Brown, Columbia, Cornell, Dartmouth, Harvard, Princeton, Yale, and the University of Pennsylvania — received nearly $42 billion in U.S. taxpayer subsidies, tax-breaks, and federal payment of contracts, grants, and direct payments. 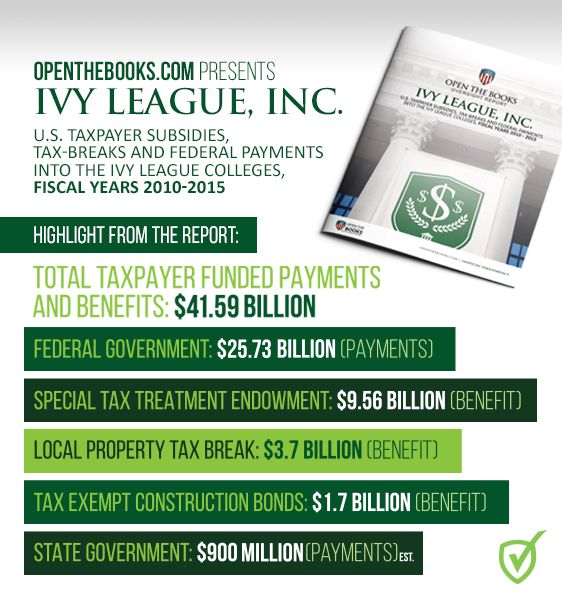 Ivy League payments and entitlements cost taxpayers $41.59 billion over a six-year period (FY2010–FY2015). This is equivalent to $120,000 in government monies, subsidies, and special tax treatment per undergraduate student, or $6.93 billion per year. The Ivy League was the recipient of $25.73 billion worth of federal payments during this period: contracts ($1.37 billion), grants ($23.9 billion) and direct payments — student assistance ($460 million). In monetary terms, the “government contracting” business of the Ivy League ($25.27 billion in federal contracts and grants) exceeded their educational mission ($22 billion in student tuition) FY2010–FY2015. The eight colleges of the Ivy League received, on average, more money ($4.31 billion) annually from the federal government than sixteen states. The Ivy League endowment funds (2015) exceeded $119 billion, which is equivalent to nearly $2 million per undergraduate student. As a non-profit, educational institution, the Ivy League pays no tax on investment gains. Between FY2011–FY2015, the Ivy League schools received a $9.6 billion tax break on the $27.3 billion growth of their endowment funds. In FY2014, the tax-free subsidy on endowment gains amounted to $3.4 billion, or nearly $60,000 per student. With continued gifts at present rates, the $119 billion endowment fund provides free tuition to the entire student body in perpetuity. Without new gifts, the endowment is equivalent to a full-ride scholarship for all Ivy League undergraduate students for 51 years, or until 2068. The Ivy League employs 47 administrators who each earn more than $1 million per year. Two executives each earned $20 million between 2010–2014. Ivy League employees earned $62 billion in compensation. In a five-year period (2010–2014) the Ivy League spent $17.8 million on lobbying, which included issues mostly related to their endowment, federal contracting, immigration, and student aid.